We continue the adventures of underground rock legend Boris Drude, whose one ambition in life is to get loaded and have a good time! But that’s no longer possible when Boris crosses the Illuminati, the Great Beast, and his own Doppelgänger! Not to mention the familiar looking Reptilian known as “Mr. Dump.” Bonus: amidst the madness, the ghost of John Lennon reveals how Paul was replaced by a Reptilian! Omaha Perez takes a sly look at paranoia gone wild! Mind-bending cover by Tony Talbert. Once upon a time, during a super-secret meeting of the Illuminati, the lizard-people summoned a Beast. Lo, that Beast descended upon his teeming hordes with wrath and a lustful countenance the likes of which has never been witnessed by the eyes of man or reptile. 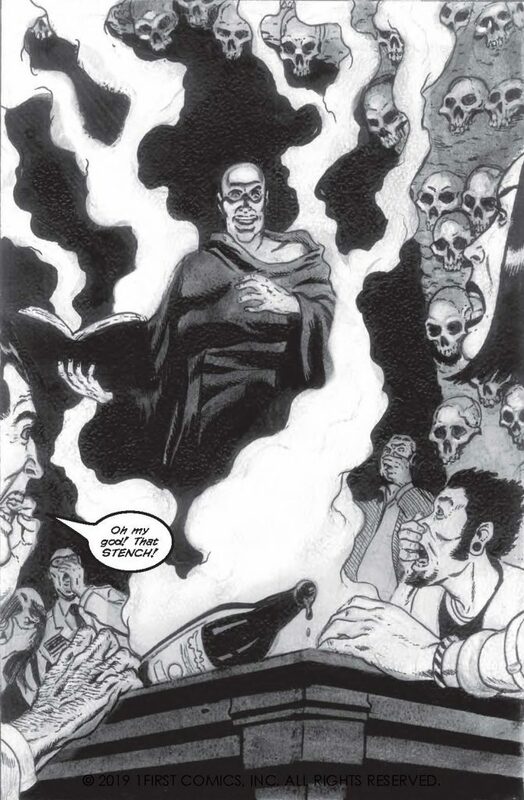 The name of the Beast was Aleister Crowley (you know… the guy from the Ozzie Osborn song), recently released upon his own recognizance from a self-imposed exile as a spirit dwelling in the closet of fringe rocker Boris Drude. Unleashed once again upon an unsuspecting but probably deserving world, Crowley would plant his seed both far and wide, that his offspring could go forth and rule with a clawed fist. All that stands in his way is the Drude himself. To eliminate this threat, Crowley banishes his foe to that most unseemly and desolate purgatory… Burbank, California… there to live out his days in obscurity, a threat to no one but himself. What the f**k is happening here? 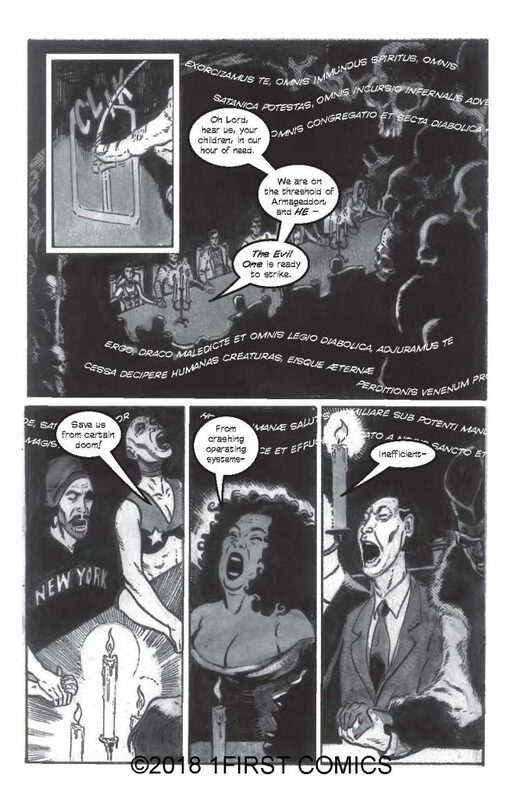 Really, if you’re out there and you’ve read The Drude, volume 1, and you know what’s going on… get help. If you’ve read it and you’re not really sure, you could still be okay. If you need further assurance as to your capacity, I’m not really the one to talk to because now that I’ve read volumes 1 & 2, I’m finding that I might have regrets over living a relatively clean and drug-free life. I mean, how am I supposed to walk the streets, surrounded by people who very well may be reptile folk hiding among us in plain sight, their true nature only revealed by the mind-opening effects of LSD? Okay… Let’s see if we can’t find something a little more coherent to put into this review. 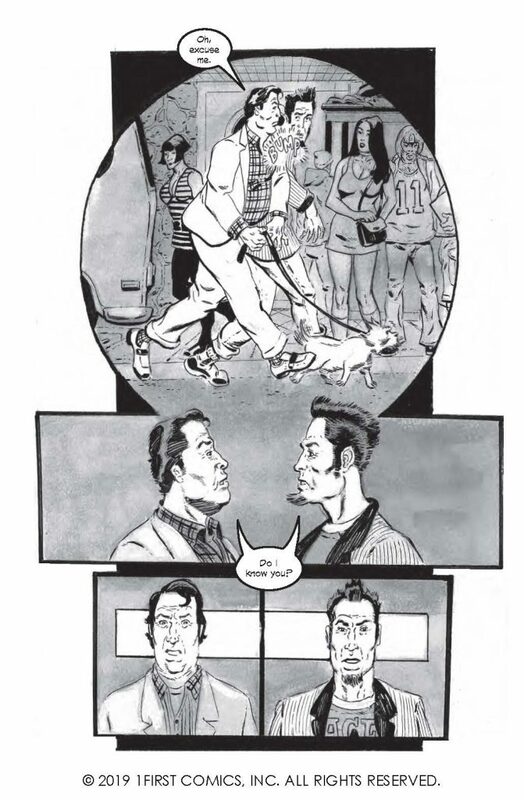 First and foremost, creator/writer Omaha Perez is either a genius or a certifiable lunatic. 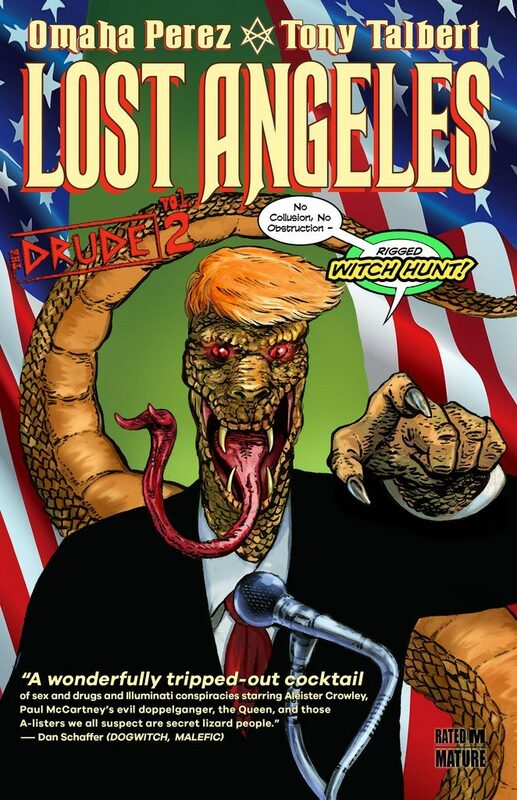 In this follow up to The Drude volume 1, in which we learned that there is a reptilian conspiracy, a shadow society that has infiltrated the highest echelons of humanity. In volume 2 we’re going to find out just how pervasive this conspiracy is and how high its reach goes (Honey Boo Boo?). In a true Prince/Pauper scenario, Boris “the Drude” Drude is body-swapped with his middle class suburbanite doppelganger, plain old Boris “I have no cool nickname” Drude, to keep him out of the way of Crowley’s grand plans. What happens next is a lot of debauchery, chaos, anarchy (“Do what thou wilt shall be the whole of the Law”)… pretty much everything you’d expect. Perez, for his part, has got to have stacks and piles of notes to keep all of this insanity straight… or maybe even he got about halfway through writing the book and realized that he had no idea what the hell was happening on the page either. Y’know what, who knows? If you’re looking for a straight-laced linear story that has a fully realized Beginning, Middle, and Ending, you’re gonna want to look somewhere else. On the other hand, if you’re looking for a stream of consciousness story, what you’ve got here is a comicbook that’s going to give you all of the mental flips of an LSD trip without the soul-searing, body-quaking crash. Perez’s partner in all of this insanity is Tony Talbert, whose name should be noted for inclusion on someone’s Watch List… I don’t know whose, but someone out there had better be paying attention. 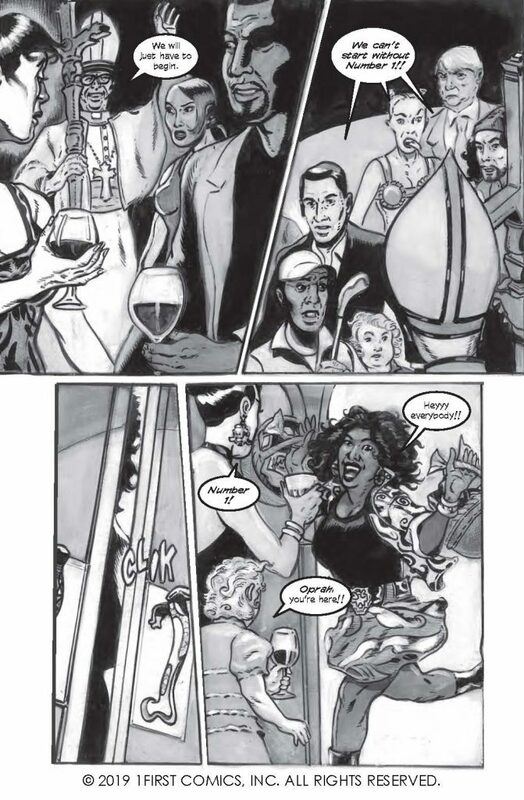 Talbert’s black and white line work is everything you should be expecting after reading my thoughts on Omaha Perez’s writing. It’s frenetic. It’s chaotic. It’s got more layers than an onion (or parfait, if you’re into that). Without looking at any of the preview pages, you should be able to get an idea of how detailed and twisted Talbert’s pages can get by picturing some of those two-page “hide and seek” layouts in Mad Magazine… the ones where all of the characters from whatever pop-culture phenomenon is being lampooned in that particular issue are crawling all over each other doing and saying all sorts of outrageous things. That’s what you’ve got to look forward to with Talbert’s work, and it’s pervasive throughout the entire 160 or so pages of this book. In all honesty, I fear for this man’s soul, and hope that he’s okay. Finally, I have to give some kind of shout out to The Drude’s Editor, Alex Wald. In general, I don’t think that editors really get much credit for the work that they do. I think that trend needs to be pushed to the side in this instance, because when I consider what Wald might have left out of this book, my head does this weird whip-crack thing and I start thinking I need to check myself in for a possible stroke or something. Mister Alex Wald… I don’t know what you did to deserve this book, but I salute you! My bottom line, just in case there’s any confusion based on what I’ve written so far, is that Omaha Perez’s “The Drude” is a creation that basks in the odd, the unabashed, the non-linear, and the ridiculous. From start to finish, it’s a story that’s told in no particular order, but by the last page it leaves you with a sense of achievement. Against all odds, every thread is satisfactorily put to rest… maybe not in a tidy fashion, but to the extent that the reader can close the book without fear of causing a catastrophic tear to the time/space continuum. If you’re tired of humdrum, orderly and logical plot progression in your reading choices, I can’t think of a better pressure release than The Drude. Just keep in mind that you’re gonna want to read it either stone cold sober, or high as fu… a really high person. There can be no in between… it’s all about the commitment.